Investigate the uses and utility of the artist’s sketchbook. A conceptual tool with a long and venerable history, it was recently celebrated at Harvard’s Fogg Art Museum. 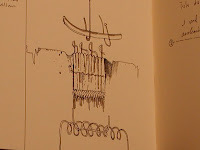 The sketchbook can serve as a planner, recording device, carrier of scrap, journal, and muse. THIS ONE DAY WORKSHOP is designed to acquaint the participant with some often overlooked, first principals of the craft of bookbinding as well as provide a platform from which the participant can merge the generation of IDEA and OBSERVATION with the creation of a hand made book. Technique and concept are fused, and so for some, this will become a welcome revelation. We will fabricate a ‘formal’ codex book with rigid covers. Knowledge of this conceptually flexible book form will ul- timately allow for a great deal of future spontaneous play. These structures are fascinating hybrids, combining a sewn text block with Ely’s development of the drum leaf binding covering techniques.There are many varieties and actions and time is provided to discuss numerous facets of the book building and thinking operations.We will discuss some surface design on covering materials, possible variants on format and engage in the mark making materials that form a foundation for exciting and durable archiving. Some of this material is being revealed here for the first time. This workshop will crack the code for you. On completion, you will have an expanded working vocabulary and will be able to explore with familiarity the manuals and literature that surrounds this subject.The world of bookbinding becomes your oyster. BIO Timothy Ely has been a student and scholar of the sketchbook form since the late 1960’s. 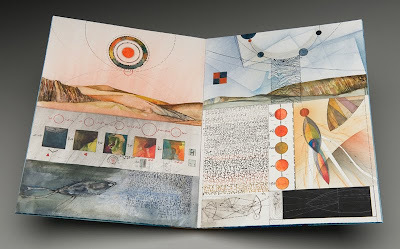 He received an MFA in Design from the University of Washington in 1975 and since that time has been making unique manu- script books, sketchbooks & archives and has been active in teaching the art of the book. He is represented by Granary Books in New York City. His books are in public, private, and secret collections planet wide. He lives in Colfax,Washington. Email Amy LeePard at Amy.LeePard@gmail.com with your name, address and telephone number. Then, mail a check for the full tuition of $70 made out to Amy LeePard. Send to 2315 7th Street, Northport, Alabama 35476. Your space in the class is only guaranteed upon receipt of full payment, and is on a first come, first serve basis. Materials kit available for an additional fee. A materials and supplies list will be sent upon registration.